The arrival of seed catalogs has the gardeners among us enjoying visions of summer produce as snow drifts start to deepen this time of year. For us crafters, knitting publications offer much the same respite. Leafing through pages of possible projects can start us dreaming of next season and garments we’d like to have ready by then. 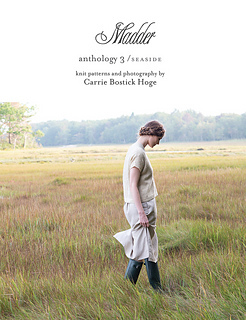 Carrie Bostick Hoge’s newest collection Madder Anthology 3: Seaside was introduced on Raverly this week and we can’t wait for our copies to arrive in March. Her designs are simple and elegant, feminine and yet practical in their wearability. These are the kinds of garments that we can easily imagine wearing on a seaside holiday or to the local market. And the photography of this collection will have you happily dreaming of warm ocean breezes and walks in the heather. We have to confess a preference for her Winter Escape Pullover. In part because of the name, but also because it was designed with Spinnery Cotton Comfort! This delicate v-neck embodies an artful balance of rugged and refined. The lace work that encircles the neckline and adorns the front is balanced by garter stitch hem and cuffs. 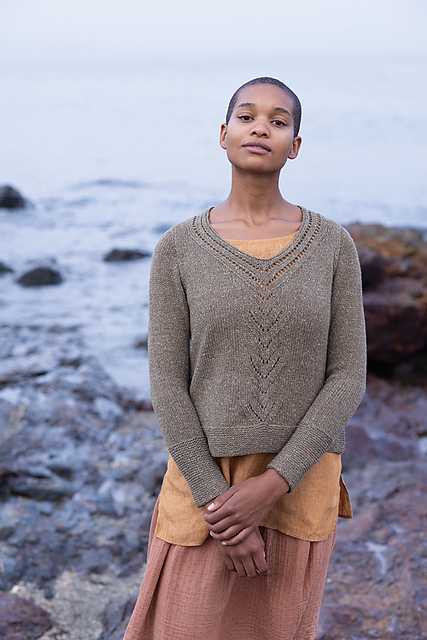 The rustic tweediness of the yarn creates visual interest among the stockinette stitches for a soft texture that mimics the weathered shoreline of Maine, evoking memories or dreams of a visit worth taking. The print version of Madder Anthology 3 is also available for preorder ONLY at makingzine.com as part of a print book & ebook combo. If you order this combo through the Making site, the ebook will be sent to you right away and the print book will begin shipping in March 2019. So for those among us that are digitally inclined, you could get cast on without delay! 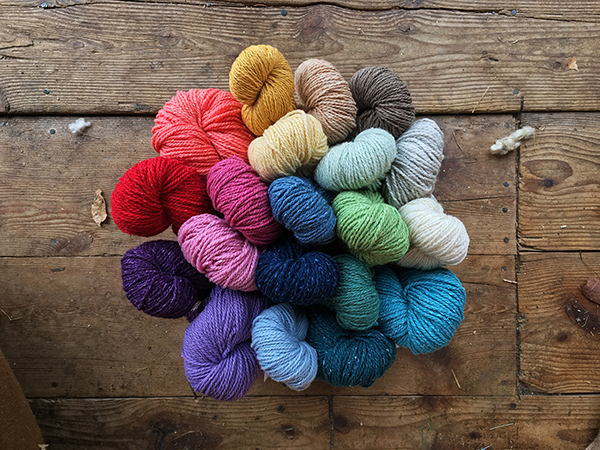 You’ll find that our collection of Cotton Comfort has a hue for everyone, with two dozen shades to choose from. We hope that this little preview of Spring fuels your dreams of warmer days to come.